Our sculptor captures the girth and strength of this magnificent elephant sculpture while detailing its looks with pride. 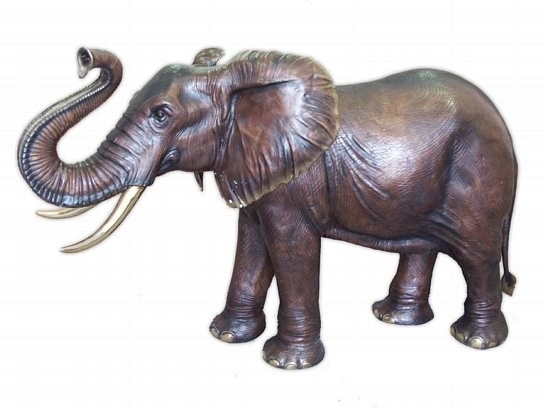 Created from bronze, our life size elephant sculpture is a beautiful addition for a zoo or park or even a museum which can hold the look of a life size sculpture. Made of bronze. Hand finished. We will match and do better on any in-stock or custom sculpture. Email us. Normally ships in 12-16 weeks. If you need this produced for shipment to you, please be advised there is a 50% deposit we need to make to the factory to commence production. Delivery is 12-16 weeks because it ships via sea freight. Did you know that elephants are poached for their ivory which is prized in black markets? All African elephants, male and female, are known to have tusks while only some of the Asian elephants, mostly males, will have tusks. Elephants are usually right or left-tusked. The smaller tusk you might see happens because it is frequently used by the elephant and hence the smaller size occurs due to constant wear.